We hope everyone enjoyed the labor day weekend. We appreciate your patience as we worked to give our space some much needed love and attention. Our staff held a service day on Saturday, you may notice that everything is a little shinier--even the skylights were washed! It was a really beautiful day of community, my heart was full seeing all of us laughing and connecting while scrubbing walls and bathrooms. Now that our new site is up and running, in addition to our monthly newsletter, you'll be able to check the blog on Mondays for a summary of what is coming up in the next week. We hope this will make it a little easier to remember your favorite events and offerings. Click on the flier to register for an event. EARLY BIRD PRICING FOR 2018-2019 YOGA TEACHER TRAINING ENDS SEPTEMBER 9. Register by September 9 and receive $250 off the price of the training. 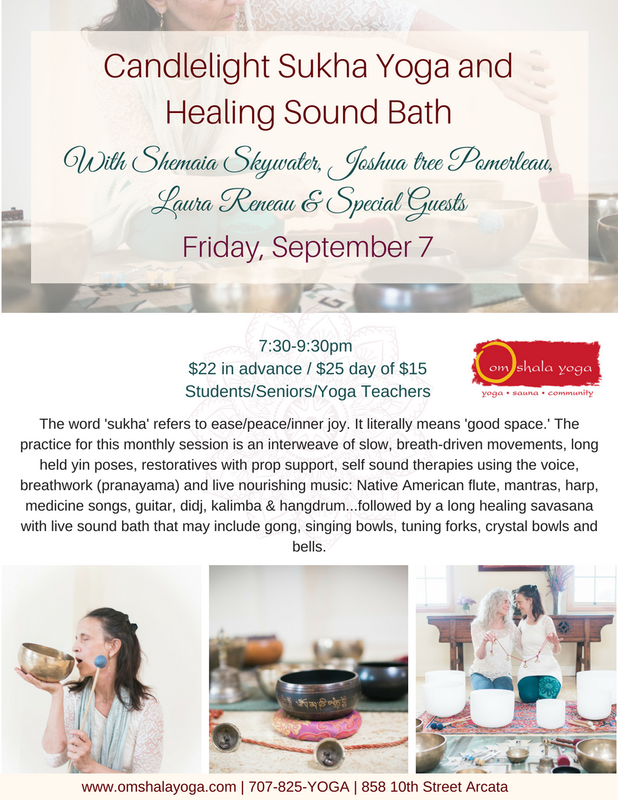 Monthly Soundbath with Shemaia! Don't miss this juicy monthly yoga and sound healing event. Perfect way to bring the hectic back to school energy down and bring a grounding, nurturing energy to your system. Monthly Kirtan with Skywater! This is our most popular community gathering. Such a beautiful time of connection to source and our yoga family. Let yourself be lifted up by these sacred vibrations. Feel free to bring comfy pillows or back jacks. Women's movement circle and sauna facilitated by the amazing Jennifer Shields. Our Sauna will be reserved for women only between 7-8pm on September 9. Jennifer will open the circle in the Sauna at 7:30 before moving on to the large room to work with movement. We are really hoping to make this a monthly women's event! So let us know the Second Sunday is a time that would work for you!